As we go to press with this double issue of Global Finance, uncertainty seems to be the dominating factor of the economic climate. There is uncertainty about US growth prospects and the nature of an unexpected slowdown of its economy, but there is also uncertainty about the future of Greece and the European Monetary Union. Uncertainty and volatility seem also to affect commodity prices, particularly crude oil prices, a consequence of the turmoil in some Middle Eastern oil-producing countries and the surprising decision by the International Energy Agency to tap emergency oil reserves to replace Libyan production. Despite this widespread uncertainty, economic forecasts released at the end of the first half of this year by major brokerage houses and investment banks appear to be moderately optimistic. In fact, they predict that by the end of the summer the dark clouds over the economic horizon will dissipate. The same forecasts estimate that in a matter of months the supply chain disruption caused by the Japanese earthquake will come to an end, and so will the uncertainty over the US public debt ceiling. Furthermore, the current strong disagreement between Republicans and Democrats in the US Congress is bound to become less heated, and the impact of the Mideast turmoil on the rest of the world will reduce. The alarm sounded by former US labor secretary Robert Reich on the risk that the American economy might suffer a “double dip” recession seems to have fallen on deaf ears. 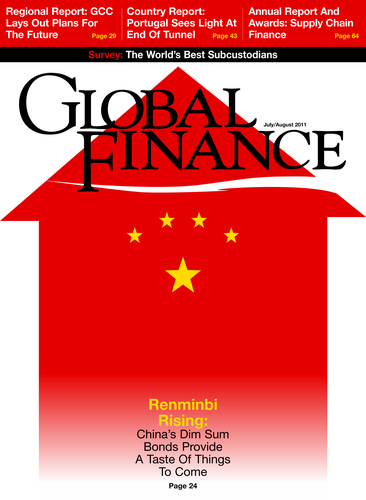 In this issue, we focus on the rise of renminbi-denominated debt issuance, as a step toward the adoption by many companies of the Chinese currency for funding their debt, and the potentials for the renminbi to become a reserve currency and one day weaken the US dollar’s supremacy. We also focus on the Gulf Cooperation Council (GCC), as it celebrates its 30th anniversary, and look at the possibility that it might extend its membership to countries outside the Gulf. In the country profiles in this double issue we take a look at two very different economies: Portugal, and its recovery process in the wake of particularly turbulent economic times, and Ukraine, where the sizable presence of commodities is fueling the country’s strong growth while its banking system is still recovering. We also devote a three-story section to some of the issues that will be discussed at the Sibos conference in Toronto, Canada, which deal with technology and regulation of banking transactions.